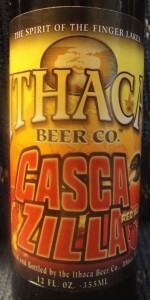 The name CascaZilla (Cas-kuh-zil-uh) is a play on both the name of a gorge in Ithaca called Cascadilla and the monster amounts of Cascade Hops we use to make the beer. The predominant flavor and aroma of this beer comes from fresh American hops. CascaZilla gets its distinctive red color from a healthy portion of caramel malt, which also lends to the beer, a hearty body and sweetness. It is a hoppy red ale! Disappointed, not really a good beer. Thanks to EGledhill for this. An amber, medium-bodied ale with a huge head that dwindled down to a thick ring leaving lacing on the sides with each sip. A piney aroma with some floral hints. A good amount of malt attempts to balance out with the hops, but the bitterness comes out a little stronger. The lingering taste of alcohol that hangs out too long is the only negative for this beer. A solid beer that I would like to try again in the future. Thanks, once again, to Reagan1984 for tossing this in on a recent trade. Pours a nice, deep red color with a dense, foamy white 1 finger head. Decent lacing left as that head slowly recedes. Smells delicious! If you are a hop head like me that is, a strong, sweet citrus hops aroma. Oddly that strong hop punch is a little muted in the flavor, as the sweet malts of the red ale style kick in to balance the bitter out. As stated, this is a amber/red, so I guess I should roll back my hops hopes, but that smell was so strong. Nice complexity to the taste, though, with that sweet and bitter battle in your taste buds. Fair amount of carbonation holds me back from being able to take too many of these, but a nice, somewhat new take on the style. Pours a tea colored amber with a massive off-white head that becomes very sticky in it's wake. Aroma is toasted amber malts and a nice hop finish. Taste...Hmmmm....the way it should be. Toasted amber malt sweetness overcome by citrus hop bitterness at the end. Nice refreshing mouthfeel and VERY clean aftertaste. It reminds me of Widmer's W'06 which was the best big red I'd had. Thanks to TheManiacalOne for the opportunity to try this. Pours dark brown to rusty red with a dense, creamy beige head. There is a thin film of lacing marked by rings as the head follows each sip. The aroma has pine resin with an orange background. This one is hop forward and spicy. A Roosterfish pint glass contains this hoppy beer with moderate bitterness as anticipate from the aroma. The malts are toasted, rounding out some sense of balance. The finish is long, subtle and earthy. Chewy with well-tamed alcohol and modest carbonation. Cascazilla is rather clean and refreshing, reminiscent of a pilsner. With lots of flavor, this one could easily be sessionable were it not for the high alcohol. As it is, it pairs well with meaty pasta. Age is no friend to this beer, as is my experience with the bottled version. Many thanks to ba vapodge for sharing this one with me! Served in a tulip glass.. NO DATE ON THE BOTTLE Although there was a January through December list on the lable.. no month was marked..
S- Sweet Carmel with a hit of citrus hop aroma.. the smell is delightful even though its very faint for a 7% Red Ipa..
O- I had this beer last summer and really didnt stand out to me.. its not a bad beer by any means but there are alot better red ipas out there.. i recommend it to people who like malty ipas.. This brew is a deep red that's very nearly mahogany. A very tight, dense head forms at about two fingers and stick around at one, leaving a thick curtain of lacing behind. There's certainly a monstrous hops presence in the aroma, and it's backed pretty well by malts. There's a light tangy citrus just detectable under the stronger flavors, and a very subtle sweetness lingers softly. Hops are big and raw in the flavor as well. Malt isn't strong enough to perfectly balance this one out, but it does pretty well. The citrus lies underneath with the light sweetness, and a leafy earthiness from the hops is in a lingering semi-dry finish. The mouthfeel has a nice blend of crisp and smooth in a medium to full body with light to moderate carbonation. This is surely a tasty brew with some nice raw hops flavor, fairly balanced by the roasted malt and sweetness and with a pretty decent complexity. Thanks to oldirtysurfer for this bottle. A nice reddish orange and little head. The smell is hoppy and there is a slight cinnamon touch as well. The taste is bitter and there is a hoppy aftertaste that last a while. The mouthfeel is smooth and the hoppinsee makes this beer a pleasure to consume. If this beer was more readily available, I would bring it home more often. The abv also shows itself a little bit. This one was a gusher. Poured from a bottle into a pilsner. Poured a cloudy ice tea brown with a tan white head. Spider web lacing with decent head retention. Smell was a nice mix of hops and malt. The taste was great. Hops up front followed by a nice creamy caramel malt finish. Very well balanced beer with a smooth medium bodied creamy mouthfeel leaving behind all sorts of flavor. Not as bitter as I expected which is a good thing. Perfect carbonation with a great body and an awesome example of this style. Jump on this one if you get the chance. Ithaca has yet to disappoint. A-Translucent ruby brown, one finger head with some lacing. S-Good deal of citrus hops, caramel malt and a tad bit of grass. T-Balance of caramel malts and citrus hops. The finish has some bitterness, not over powering but well balanced. M-Medium bodied, some carbonation, a tad on the watery side though. O-A wonderful beer, not as good as Nugget Nectar but the everyday availability is a huge plus. I was expecting a ridiculous, extreme hoppy beer just from the label and the marketing. I was pleasantly surprised by the modestness and moderateness of this beer. It pours a very clear amber with a soapy type head that laces and somewhat retains. The smell is hoppy resin, pine notes, some soapy aromas that detract somewhat. I can't quite figure out what the added smells are about. The beer is moderately carbonated, nicely hopped, but quite well balanced until the finish where the hops do impose themselves above all else. You will get a light to medium bodied beer that has that very nice hop resin taste and texture. There are some malts to balance things out. The aftertaste is a bit sharp, but would you expect anything less from a beer that labels itself as "monstrously hoppy?" Worth seeking out. L'Chaim. I had this beer two days later on-tap at Red Bones in Davis Sq. in Somerville, MA. This beer is very good, and I would add some overall points to the beer. The dry maltish backbone very much complements this beer, and the piney hop resin notes do come through quite nicely. There is also more of a creamy mouthfeel with the beer on tap.